Influence legislative policy at all levels. Create targeted actions that allow your supporters to send targeted messages directly to local, state and federal policymakers and custom targets. After selecting your legislative targets, choose which channel to allow your supporters to use when reaching out to those policymakers. Connect grassroots supporters to their legislators via telephone. Provide them with scripts, recordings and talking points relevant to your agenda, and watch them burn down legislator phone lines! Encourage your supporters to send specific messages to policymakers through the web forms on legislator websites. Allow supporters to send a message directly to your legislators Facebook inbox or comment on their latest post. Allow Tweets to come directly from supporters to representatives that you're trying to influence. After completing the targeted action, give your supporters the opportunity to share this action with their Facebook friends or Twitter followers...This exponentially amplifies your reach! Request a Custom Pricing Quote Get Started With a Demo Today! Make it easy for activists to take action. Create beautfiful action pages with drag and drop functionality then mobilize the grassroots through emails and social. Add your targeted action to your website in one of two ways. Copy and paste automatically generated code into a new blank page or add the code to be part of an existing page. Let your supporters choose to call, email, Facebook message, or Tweet a rep. This is what your online supporters will experience on desktop. After completing the action, your supporters will be redirected to a thank you page. All Salsa Engage pages are pre-built to be mobile-responsive. Preview your action pages and thank you pages before publishing to the world. Then, empower your supporters to easily take action from anywhere on any device! Measure the success of your targeted actions by number of supporters engaged, calls made, emails sent, social messages sent, and specific legislators who were contacted. Track conversions, traffic sources, page views by device and more on specific action pages with detailed page-level analytics. Build and broadcast a targeted action alerts in minutes with flexible, drag and drop email advocacy tools that are mobile responsive. In an effort to end the sale of tobacco, Campaign for Tobacco Free kids has launched a custom targeted action to Walgreen's executives. Campaign for Tobacco Free Kids gives supporters the opportunity to send an email, Facebook message, and Tweet directly to Walgreens and their executive team. Save the Children Action Network has a number of "Take Action" pages on their website. This one directs visitors to send a message to Congress to fight famine overseas. Save the Children Action Network has a national campaign directing supporters to target their Federal Senators. Easily build petitions, pledges, and more with drag and drop configuration. Add photos, change colors, adjust layouts, customize form fields and start capturing new subscribers in minutes! Everything in Salsa Engage is mobile responsive so that your supporters can take action on any device. Want to be sure? Preview your forms on desktop, tablet, and mobile before publishing. Immediately thank your action takers, make it easy for them to share your petition on social media, and tell them more about the work your organization doing and how they can help! Facilitate rapid action by quickly creating and blasting out your 'take action' email to the right segment at the right time. Use spam checker to optimize email deliverability. Guess work is over. Optimize email performance by testing two versions of the subject line, sender name, or content. Automatically send the winning version to the whole recipient group. Monitor the performance of your emails with dashboard insights. Create posts and schedule social media updates to publish at the same time as your email action alerts for maximum reach! Amplify list growth with Facebook Ads! Install Facebook’s tracking pixel onto Salsa Engage pages, then specifically target Facebook ads to people who have visited those Engage pages. Use Facebook Lead Ads forms to capture new petition signees and convert people who click your Facebook ad. That new supporter data automatically syncs back to Salsa Engage. Target previous action takers via Facebook Ads! Create a custom group in Salsa Engage and sync that group to Facebook. Then, in Facebook target that group and ‘look-alike’ audiences with ads. Welcome your brand new supporters who just signed your petition or joined your list with a series of pre-scheduled emails that further educate them on the issues. Report on supporters, email engagement, petition pages, actions taken, social activity and more. Track current initiatives and make informed decisions about future campaigns. Earth Day Network asks web visitors to pledge to stop using disposable plastic! Natural Resources Council of Maine uses Salsa's Legislator Lookup tool to capture new subscribers looking to identify their local, state, and federal policymakers! Salsa's client success hub, THRIVE, surrounds you and your team with the training, coaching, and support you need to maximize the impact of your grassroots advocacy campaigns. You're investing in Salsa, and we're investing in you! The Salsa Scholars eLearning platform contains self-paced, instructor-led tutorials and activities that will help you master the basics and conquer the most advanced capabilities of Salsa Engage and Salsa CRM. Smart Start Advocacy helps brand new users combine online engagement best practices with the functionality of the Salsa Engage platform. 1-on-1 coaching calls and instructor-led guidance will help you build your first petition, email newsletter, and welcome series. In-app tips and a rich knowledgebase empowers you to learn, troubleshoot and grow on your own. Plus, from 8AM to 8PM ET Monday through Friday, you'll have email and phone access to a support team obsessed with helping you succeed. 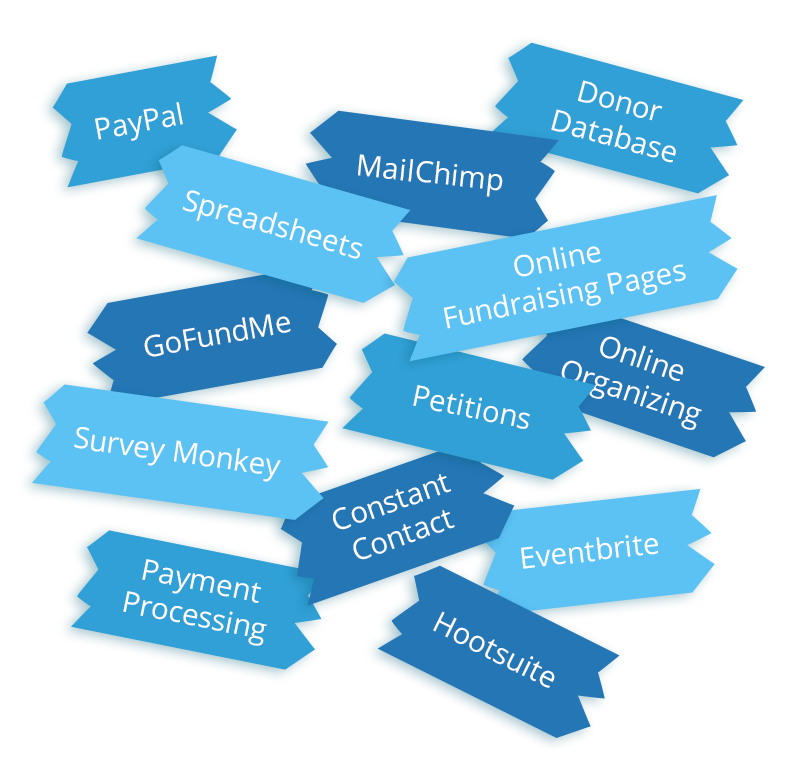 All your fundraising tools without all the hassle. Why use a combination of disparate tools? When you can get it all in one unified suite. 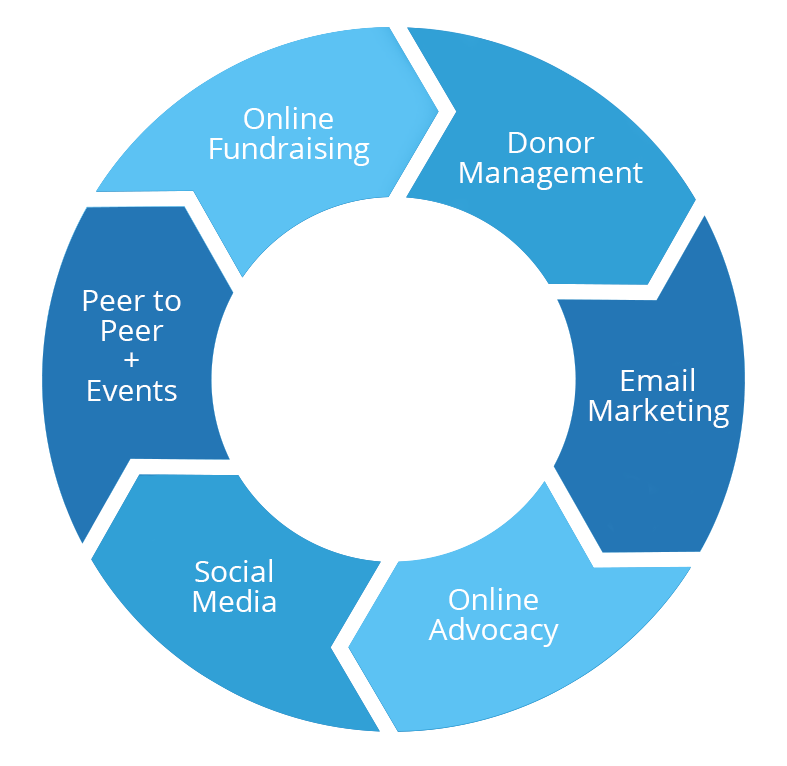 See How Salsa Can Help Your Organization's Mission! Get Started With a Demo Today!